Former machine gunner Ian David Long – who reportedly suffered from PTSD – used an illegally-modified handgun to target drinkers at the Borderline Bar & Grill in Thousand Oaks. The former Marine donned a black trenchcoat and ski mask before storming the bar on a student night to unleash around 30 bullets in a two and half minute killing spree. Now the lone gunman's neighbours have revealed the shooter's own mother “lived in fear” the former soldier would one day go off the rails. Divorced Long – who turned his gun on himself after his murder spree – lived with his mother, Colleen Long, and three German shepherds in a quiet suburban home in Newbury Park. Earlier this year, police were reportedly summoned to the home after a bullet had been fired through one of the home's walls. The street was blocked off, and police spent hours trying to get Long to peacefully come outside, reports the Wall Street Journal. “They couldn’t get him out for a long time, like half the day,” said Mr Berge. Other neighbours said Long was a veteran suffering from Post Traumatic Stress Syndrome (PTSD). One said: "I have no idea what he was doing with a gun". The Ventura County sheriff confirmed in a briefing Thursday that deputies responded to a disturbance at the Longs’ home in April and mental-health specialists were dispatched. However, they determined that Long wasn’t a threat and didn’t qualify for an involuntary psychiatric hold. Law enforcement also was involved in an incident in 2015 in which Long was the victim of a bar fight, the sheriff said. Long was married in 2009 in Honolulu, but separated in 2011 and dissolved the marriage in April 2013 in Ventura County, California. He and his then-wife said they had no children and owned no property. A settlement agreement stated: "Irreconcilable differences have caused the irremediable breakdown of our marriage." Investigators haven’t yet determined a motive for Wednesday killings – which took place on the bar's student night. Chilling video footage captures the moment around 200 terrified revellers fled the venue as multiple shots are heard ringing out in the background. Cops were first alerted to violence at 11.20pm local time last night when Long shot a security guard and a young female cashier after throwing smoke grenades around the bar to create confusion. Screaming in fear, youngsters attending a student night at the club, rushed for the exits, dived under tables, shouted "get down!" and used bar-stools to smash second-floor windows and jump to safety as gunfire erupted. Survivors said Long looked "like he knew what he was doing" as he methodically fired his legally purchased Glock .45 handgun – said to have been modified to hold more rounds. The extended magazine – which is illegal in California- allowed the gun to carry more than its typical 11-bullet capacity. The first sheriff's deputy who first attended the scene is among the 12 victims who have been confirmed as dead. Respected Sgt. Ron Helus reportedly also ran a business teaching gun safety to firearms owners. “He was going to every call that he could, because that’s how he was…. and rushed here to continue doing that, to continue saving lives,” Senior Deputy Julie Novak told KCBS. Helus – who had been a cop for 29 years – was reportedly due to retire in a few months time. Six unarmed, off-duty law enforcement officers who were at the bar stepped in to help, Novak said. A woman whose daughter was at the bar during last night's shooting there told officials one of the officers “stood in front of her daughter — protecting her life with his own,” he added. 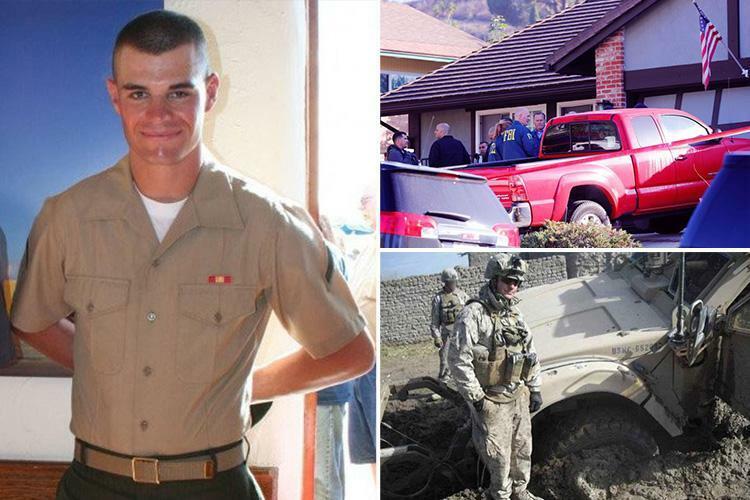 Officials said former marine Long died from a single gunshot wound after exchanging fire with police at the Borderline Bar and Grill in Thousand Oaks – 40 minutes drive from Los Angeles. He lived in Newbury Park, about five miles from the bar and was a former student of California State University Northridge. Authorities hope a search of his home will provide clues about the motive. About 30 shots were said to have been fired during the rampage that last no longer than two and a half minutes. Witness Bryce Viole, 19, told The Sun Online how the 6ft tall gunman was dressed in black and had a ski mask on the lower half of his face. The student told how he suffered several injuries after jumping head first out of a glass window to escape the carnage. He said: “I looked over and saw the shooter and the gun and I just dropped to the floor and started crawling towards the window. “He just kept firing towards the pool table area. “I ran and dove out the window head first, I just smashed through the glass and jumped out. Another survivor Teylor Whittler, whose father was in the military, told ABC that the mask-wearing shooter appeared to have some level of gun training. She said: “He changed clips really fast. He knew what he was doing. He had perfect form. Witness John Hedge told ABC7 he saw the attacker throwing smoke grenades into the front of the venue after shooting a security guard. John, who was stood at the front door, said: "I just started hearing these big pops. Pop, pop, pop. There was probably three or four, I hit the ground. "I look up – the security guard is dead. Well, I don't want to say he was dead, but he was shot. He was down. Police cordoned off a huge area around the Borderline Bar and Grill, lighting flares in the road to turn away traffic. Armed officers from the Ventura County police and sheriff’s department, SWAT team and FBI patrolled the scene, while helicopters circled above. Tearful students huddled in blankets, behind the cordon hugging and waiting anxiously for news of their friends. In a tweet about the mass killing, US President Donald Trump said: "I have been fully briefed on the terrible shooting in California. "Law Enforcement and First Responders, together with the FBI, are on scene. Thirteen people, at this time, have been reported dead. "Likewise, the shooter is dead, along with the first police officer to enter the bar." Thousand Oaks is one of the least dangerous towns in America, according to FBI statistics. It was ranked as the fourth safest among cities with a population greater than 100,000 in the US by the FBI's 2013 Uniform Crime Reports.